Aaargh! What could be worse than the horrid kids you met in David’s last book of brats? These even worse little horrors! Quick: run away and hide! This second time around, the boys are even beastlier and the girls are even ghastlier. Like – is that even possible? YES! From Gruesome Griselda to Fussy Frankie, they’ll leave you in stitches of horrified laughter. But hang on! Well – hello! Who on earth invited Raj? I loved it!! !❤️ It was sssssooooooo funny!!!!!!!!!!!! 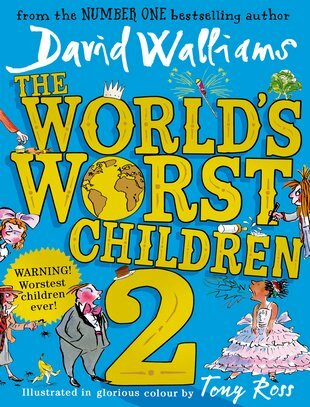 😂🤣😅😁 It was about ten ‘World’s Worst Children.’ And one of them is a GIANT baby called Humbert!!!!!!!!! !